I am not much involved with text to speech these days, but I did experiments in this area a few years ago. Simple text to simple English has been around for a long time. But support for other languages was always limited, and even with English, the voices always sounded very robotic, and often failed to understand the simplest of native language constructs. You can still make out that it’s a robot and not a human, but it’s way better than anything else I’ve heard so far. By far! 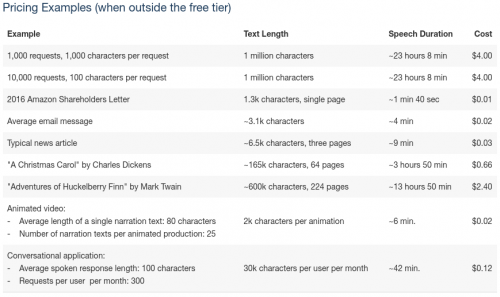 Pay-as-you-go $4.00 per 1 million characters (when outside the free tier).